Hen Coleman, born in Venezuela in 1964, graduated with a BA in Fine Art from Farnham UCA (2003) and a MA in Printmaking from the Royal College of Art, London (2006). Her studio practice is based in East London. Since 2010 she has also worked as a Printmaking Tutor at The Royal Academy Schools in London specialising in 'hybrid' forms between traditional and new print processes. Important Collections include the Royal College of Art and the V&A (Victoria & Albert Museum) Print Collection. Hen's drawings depict altered territories, informed by landscape in which the protagonist’s role is carried by recurring motifs of vessels as containers and layered natural forms in transformed states. ‘The contrast between a terrain of ‘chaotic and abundant nature’ and the more measured environment of our ideas and behaviour presents itself as a dialectic which it feels interesting to deal with. It’s a third territory, not necessarily geographical or historical, but as an unfolding space or stage for playing out memories, responses and reactions. 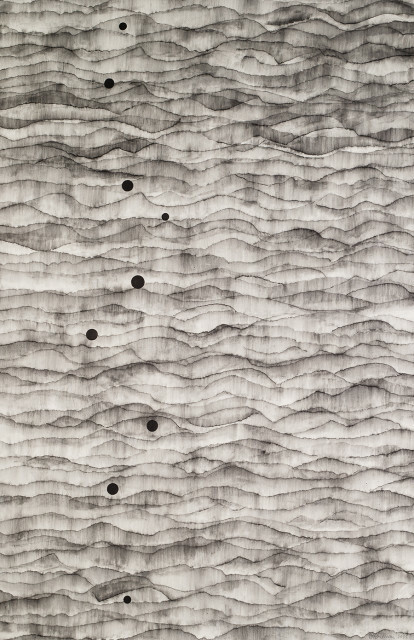 These altered landscapes are presented through a combination of drawn and printed process, from the precision within her intricate frottaged woodcuts to the patterning of largescale charcoal and ink drawings. Hours of intense close manual work become fluid, flowing images. Here echoes can be found — the hours spent, the details, shapes and repetitions drawn — that make her work a pivot from which we can connect and follow through the threads to all the other artists in this show.